Ok so in text form: the cart drops and is boosted to the back. The cart comes back and is boosted to the front. The cart hits the clock pressure plate. The first piece of track with torch input is here. It sounds like you have this working. Leaving the boost-loop the cart goes up a hill. The second piece of track with torch input is here. This is the one you will need to care about. 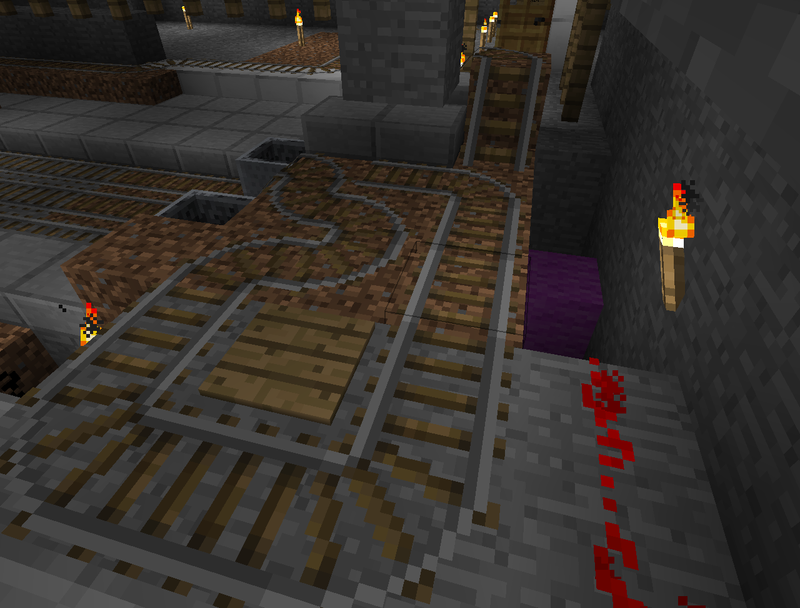 There should be a stone pressure plate on your main line with redstone running to this switching track piece. Then if you are in a cart the booster comes out to boost you, otherwise it goes up to the reset. 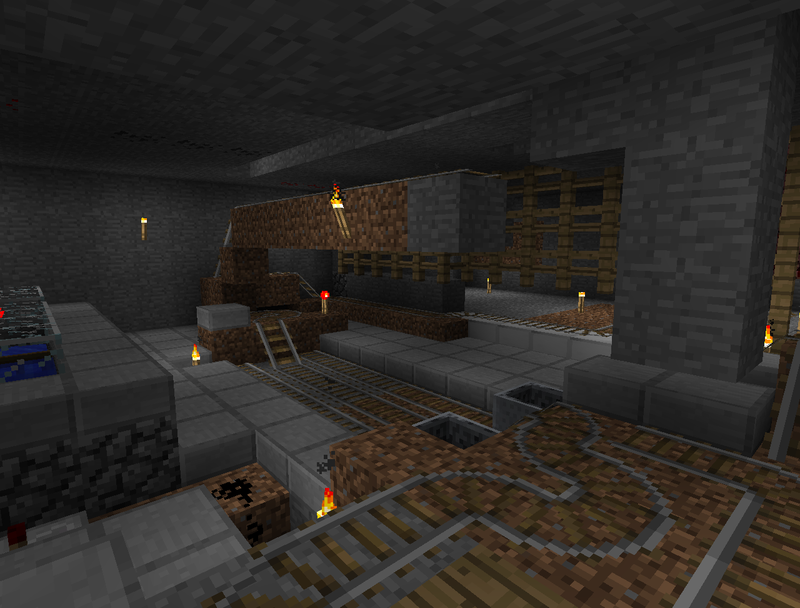 There's no fancy redstone machinery involved in this so there's really not much to say. Edit: I did pictures and some re-explanation so scroll down to those. Now there is another variation you can build if you feel so inclined. Instead of the free fall gravity drop reset you can incorporate a door booster. This will change the space it takes up somewhat but not by much. Instead you place a door next to the ramp up and then direct the cart up so it will land on that door. A few posts back you can see a picture of this sort of thing but it is ok to have the track sideways- door boosters don't need it facing the door. The advantage with this is that you don't need your cart to sit on a stone pressure plate (at least not to call the cart.) Instead you wire a button to the door to start your booster when you choose. This makes the whole thing slightly more reliable at the expense of basically a door. However with this you know that you always want the booster to come out and send your cart along, so you don't need to make that second piece of track ever switch. You can place a T intersection with the curve facing the door and your main line- the booster cart will come straight out when it is leaving the double boosters but then curve up the hill on return. So I used wood for every tile involved in opening the door. * made a goof- the pressure plate for the clock is cut out of the frame in the middle picture (and not actually built ::cool.gif: The tile just after the switching piece would be the one that triggers it and the plate would be just off the bottom of the image. You would also want to make your button reset your clock or have some other reset because the cart obviously won't ever hit the first plate again. Like this you would have most of the system below ground level and given the height of a door booster I don't see much reason to have the boost at a middle level. The door is 2 tiles up the ramp. Just giving the cart one tile to roll down probably won't give enough momentum. Three high should be slightly faster as the cart won't slow down. Anyone got any optimizations they would like to make? I'm having a problem here. Whenever I go to place the vertical redstone torches, the track directly above is switches to the restart mode thing. 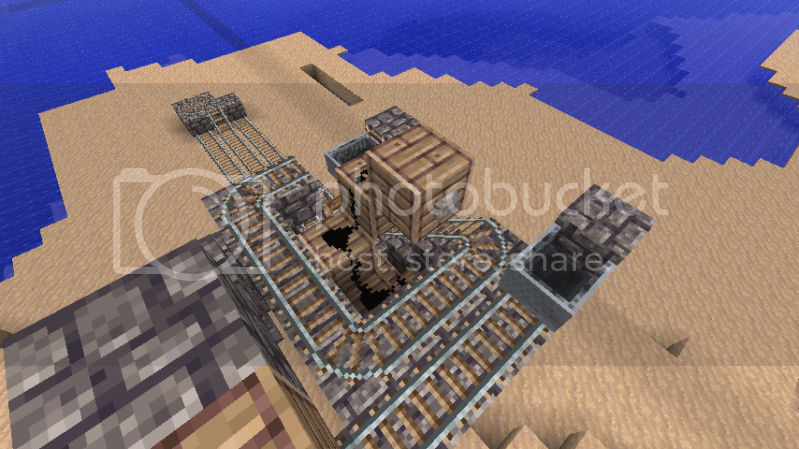 This causes the minecart to 'restart' 5 times and then go around like it's supposed to. It's reversed basically. So... I need some help with this thing. I don't even understand how to post a picture! If it is backward you need to stick another torch under it or otherwise invert the signal somewhere between the timer and the torch for that piece of track. I'm having the same problem, if I add a fourth torch it switches the track back to the correct way, but then never changes once the boat is on the plate. Ah, the problem is that we're just too used to redstone. Ok so what I mean by add another torch is not "dig a hole and put a torch under than and you're done." What I mean is "dig a hole and put a torch down there then make the redstone go to the new torch." Likewise if you have space you could stick an inverter somewhere before the stack of torches. I've said that before though so either you have no space or you just ignored it because option A was so much more appealing- but either way it is the same thing- you need to make the redstone have power at the opposite time. To do that you've got to go in to the line of redstone and redstone torches and somewhere invert it- which means adding one torch. Sticking a torch on the side won't do, you've got to clip the line, shove a torch in, and then move the line so the torch is in it. I added a repeater and it's working now. Apparently the length was too long? Are you building these things without being able to see the redstone? I usually carve out extra blocks just so I can check on things if it doesn't work right away then I fill the blocks back in later. Edit: Wait, repeater (2 torches) or inverter (1 torch) or the actual repeated block (like 2 torches)? The actual repeater block. I could see the redstone lighting up all the way to the torch stack previously, but it wouldn't change the torch stack on/off. So because tame wolves do not despawn we should be able to get better boost by placing one in the middle cart right? It would lose 1/8th as much energy in the turns and going out to boost you right? *It's 8s right? I can't ever keep the ratio straight. We'd get much better boost! Hell, you'd probably be able to loose a booster cart if you wanted to. The loss is very high for every non boosted track an empty cart goes over. What do you mean loose it? Just send it out to whatever because it's basically not going to stop any time soon? e: kind of surprised it took this long to shrink TFFs much but glad to see people are doing it. 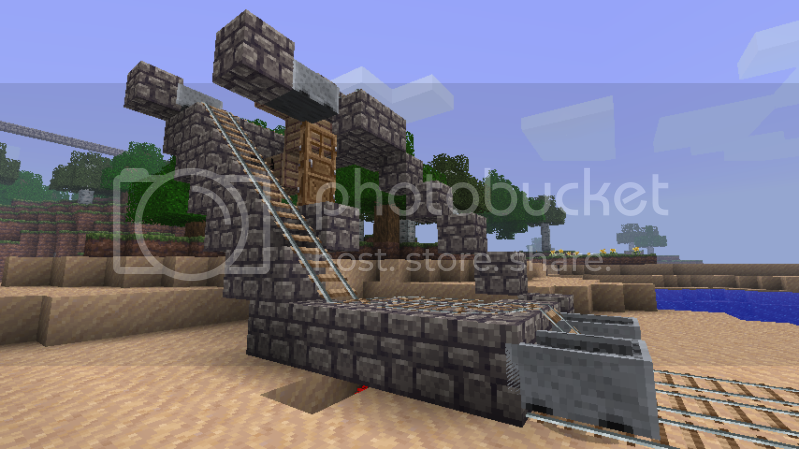 Preliminary tests show that wolves will sit appropriately in a minecart. Was kind of hard to get him into it to begin with but he eventually popped in and has remained since. I haven't tried going far enough to unload the chunk but I doubt that will snap him out or anything. Alright, looking for some help here; I'm running into intermittent stalling, even while players are present. Fairly simple setup, with a number of minor variations that, to my knowledge, shouldn't be affecting matters. 1. For simplicity, due to location, the boat timer is now adjacent to the booster, rather than under. I had to rework the wiring, but got everything working fine there. 2. Reworked the Pressure Plate loop in order to get the cart to trigger. 3. Combined the reset and side tracks, making sure it ends with a full stop against a wall. It does make the full five boosts each round, and appears to reset completely. The last point seems like it would be the one most likely to cause side effects, but it's simpler this way, and I thought I had incorporated all of the key points. Thoughts? Where does the cart end up when it stalls? Edit: Since the last update carts have come to a stop when you log out so these designs require something like a door booster. You should be able to make it more compact like that and shorten the wait time. I also seem to see a few places where you are making the cart turn right next to walls. When this happens prior to boosting the cart you lose a lot of the energy. *this is any position where a corner of the cart is visually hidden inside the wall- so when it is facing diagonally during turns. Although the patch doesn't seem to have broken minecart boosters in any way it has caused me one inconvenience: my dog fell out of the booster cart the first time I tried to drop it. Getting him back into it and trying again he stayed but I hope this isn't an "every time the game loads" thing. Edit: Looks like that's exactly what it is. If we want to keep carts occupied we're going to have to at least not drop them. I don't know if the dogs'll pop out from just horizontal movement. Anyone else having Feedback loops occuring with their wiring since 1.5? I have it just the way you do 8bit, but when I connect the counter to the booster, all of my redstone torches go out, with out coming back on, therefore causing my boat to get stuck. Any Ideas? Edit: Okay now the redstone is back to regular function, but the boat is having issues turning. I've seen a few issues where redstone doesn't update correctly since the patch. About how far does this station need to send carts? I've been trying to think of ways to make this more compact with a powered rail reset but it feels like every idea is crap. How do you activate a stone pressure plate while on a track that joins to other tracks on both sides? 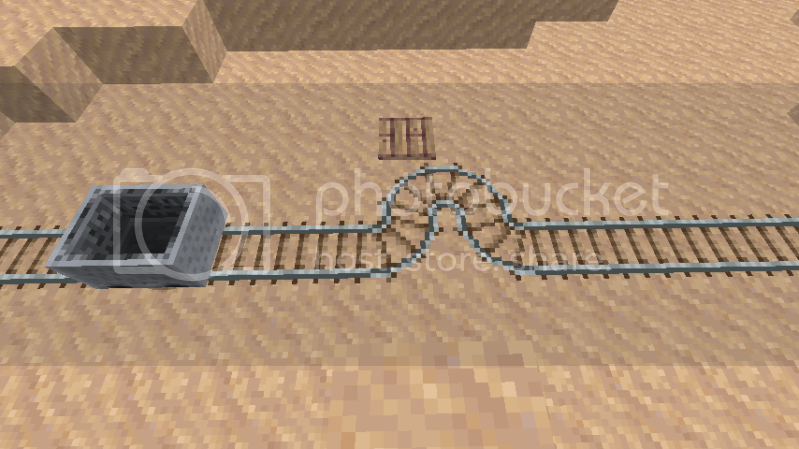 Not through using the method where the minecart flips out, but with diagonal tracks? I can trigger a wooden pressure plate, but not a stone one. Why is this? Aww shoot, I forgot wood plates don't act quite the same as stone plates. Ok so minecarft crashes my computer relentlessly since the last patch so I can give a screenshot of a position where the plate will work. I'll try and make a picture. Imagine this is the sloped track going up to make a backward ? shape (the far end of a smart booster.) The green wool is where a stone pressure plate should work. If you can't make sense of the picture or that doesn't work just throw a bunch of plates down next to some track until you find a spot that works. It definitely can be done. Other kinds of curves can be finicky so most times you will have to guess and check. *You can't just push a cart past it to check. They will trigger differently with slow carts vs top speed carts.